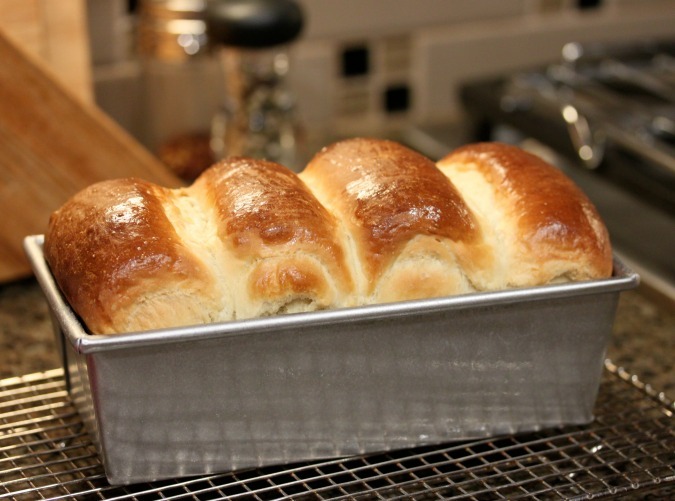 This Hokkaido Milk Bread using the Tangzhong Method is the softest fluffiest bread you will ever produce. It's very different than most of the artisan style breads that I usually make. 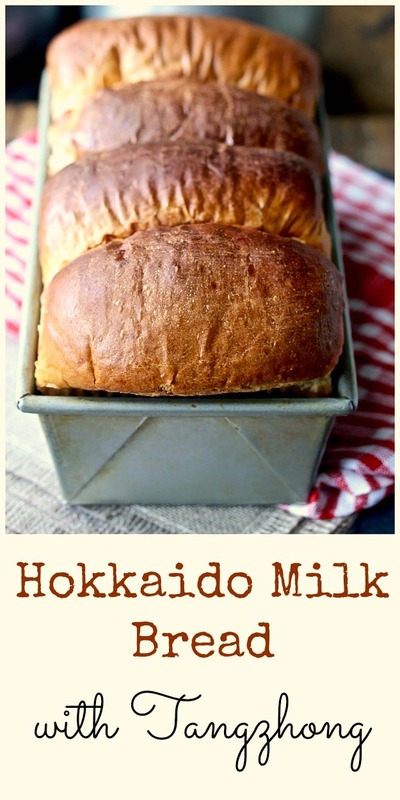 This Hokkaido Milk Bread is reminiscent of Hawaiian bread, and it seems to stay fresh and soft for a long time. The oven spring is amazing. 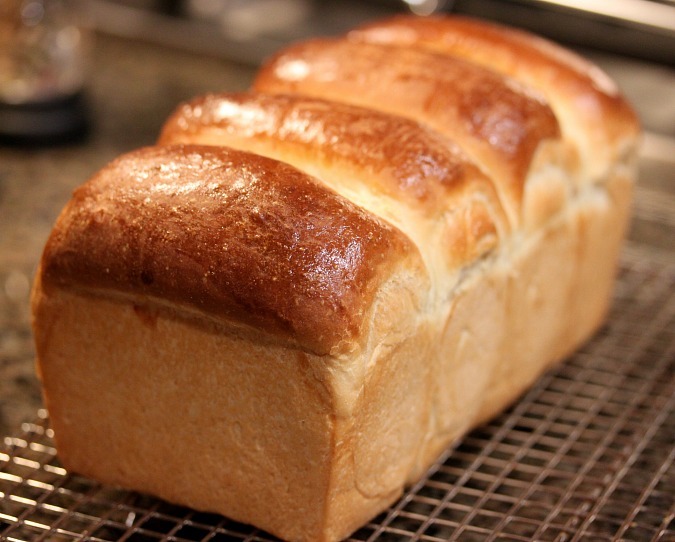 Hokkaido milk bread is a favorite in Asian bakeries. It's super soft and slightly sweet. The bread includes something called a a tangzhong, which is a roux of flour and water, which is cooked, cooled, and then added to the bread dough. It has magical properties that turn the resulting loaves into fluffy cloud-like bread. While not the most scientific explanation, it's pretty amazing. 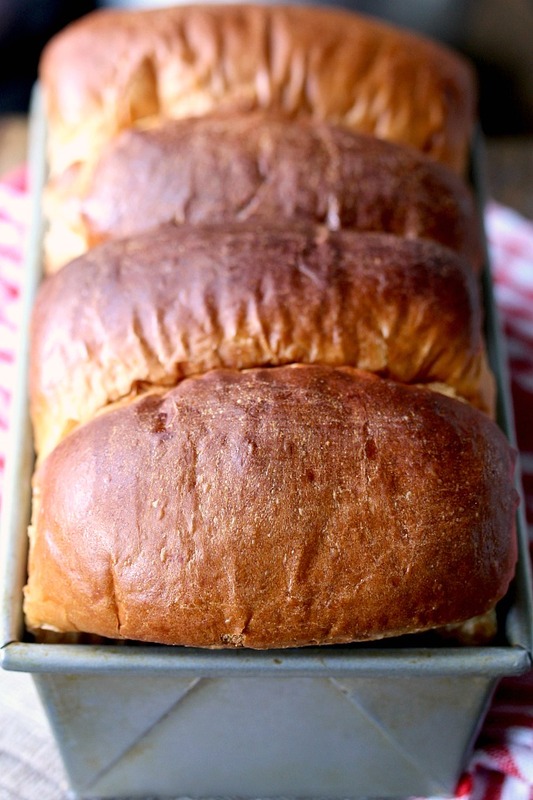 You'll be craving slices of this bread fresh from the oven and slathered with butter. You can use a stand mixer or bread maker for the initial mixing of the dough and first rise. You might be able to hand knead it, but the dough is really sticky and it will take you a very long time. I used this stand mixer with the dough hook. It's a workhorse. A kitchen scale. They are inexpensive and take the guesswork out of baking with flour. They are also great for dividing the dough into four parts. An instant read thermometer to tell when the roux has reached 149 degrees. If you don’t have one, cook the roux until the spoon you are using to stir it leaves a trail. Note: The recipe calls for caster sugar. If you don't have it on hand, you can just whirl some granulated sugar in your food processor or blender to grind it more finely. The explanation of how to shape the dough may seem confusing, so I've tried to take some photos of the steps. Form the dough into four balls. Roll each out into a long piece. Fold the dough over from the top like an envelope. Fold the bottom over the top fold. 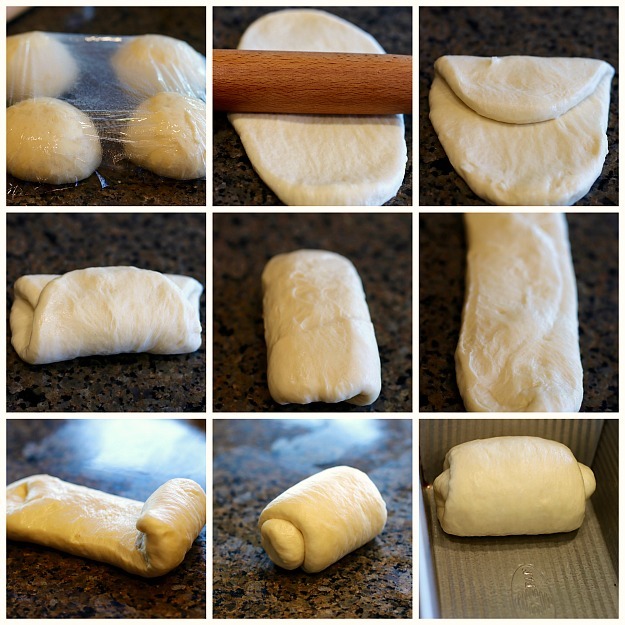 Begin to roll the dough into a cylinder lengthwise. Turn the cylinder to seam side down, and place in the bread pan. Here they are, all nestled together. Or, you could use my well worn hand written cheatsheet (I'm a visual learner)! Whisk the flour and the water together until there aren't any lumps. Place the mixture into a small saucepan and heat over medium heat, stirring constantly until the mixture reaches 149 degrees F. If you don't have a thermometer, cook until the spoon leaves a trail in the mixture. Immediately dump the mixture into a heatproof bowl, and let cool. When it has cooled, cover with plastic wrap, pressing the wrap against the mixture, and refrigerate for 4 to 24 hours. Whisk the dry ingredients in the bowl of a stand mixer. You can also use a bread maker for mixing the dough (don't use the bread maker for baking the bread). Add the egg milk, and the tangzhong, and mix and knead until a dough forms. Add the butter pieces, and knead on medium high speed for 15 to 20 minutes, until a piece of the dough can be stretched into a very thin membrane. Place the dough into an oiled bowl or dough rising bucket, and let rise in a warm spot in your kitchen until doubled in size, about 40 minutes. If your kitchen is cold, this could take longer. Once risen, deflate the dough, and divide it into four equal pieces and form them into balls. Cover with oiled plastic wrap, and let rest for 15 minutes. Preheat the oven to 350 degrees F.
Take each piece and, using a rolling pin, roll out into a long oval shape. Fold the shorter sides of each oval over like an envelope, into sort of a square. Flip the squares over, and roll out into an oval again. Flip them back over, and roll each oval into a roll/cylinder, from one end to the other. 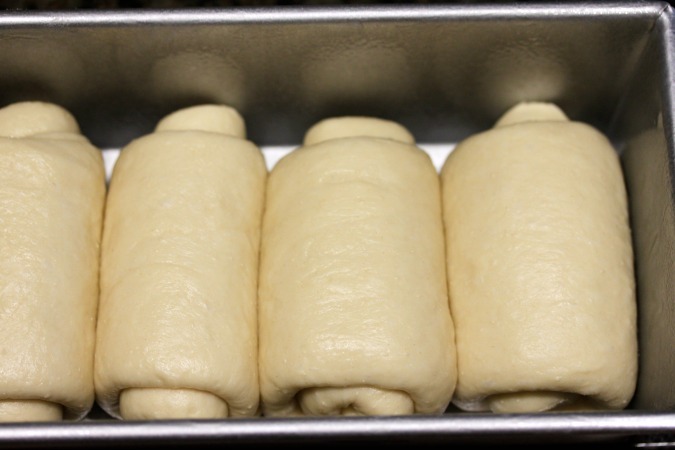 Arrange the rolls in an oiled 9 inch by 5 inch bread pan, cover with plastic wrap, and allow to rise about 3/4 of the height of the bread pan, about 40 minutes. Brush the loaf with the egg wash and bake for 30 to 35 minutes. If the top gets too brown, tent the loaf with foil while baking. Recipe adapted from Christine’s recipes. March, 2018: I am updating this post to give you some step-by-step photos of the shaping of the bread, as well as give you a printable version of the recipe. Lol. You might have to be a "bread head" to have the patience, but it is very good if you like super soft fluffy bread. YES IT IS , I'T BETTER!! Karen, This bread is fabulous! Thanks for sharing with the Artisan Bread Bakers. I enjoyed making and eating it. Made hot dog and burger buns from this. GREAT! Thanks. Fantastic. I'll have to try other shapes! Thanks so much for sharing. Made this twice today. :-). Really soft and fluffy. I really would like to try this. The folding sounds confusing to me. Could you put a step-by-step picture of what you do by any chance? :-) Have you ever just made this in a bread machine (rising and baking)? I am in search of a soft sandwich bread recipe. I will definitely do another post on this with step by step photos. Thanks for the suggestion. I don't own a bread machine, so I'm not sure how that would work. Also, my son has severe allergy to egg. Have you ever tried without the egg by any chance? No, I haven't tried it without egg. Thanks for the contribution! Especially about the microwave. Very precise. my daughter has been asking for soft bread. will try this tomorrow, thank you! Thank you! You will love this bread, and so will your daughter. Let me know how it works out! Thank you! It is a revelation, isn't it? Thanks for posting this recipe and details of how the loaf is made. My loaf turned out beautifully and the oven spring is amazing. I followed your instructions and recipe to the letter although I added an extra 2 tablespoons of flour because I thought the dough was a bit wet. Also, I used my breadmaker to do the initial mixing and proof. Outstanding loaf - soft, light and just as nice a couple of days after baking. Thanks so much for the feedback Sharen! Love this recipe, we are all raving about the bread rolls I made from it, will never go back to store bought rolls again! Followed instructions to the 't' perfect loaf, thanks for sharing! Thanks so much Bernice! I love hearing this. Hai Karen can i cold fermented this dough? I haven't tried it, but I suspect you could. 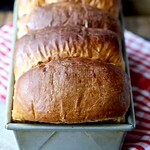 I am very impressed with this post and how well you explained out to make this bread - and your photos are excellent! I definitely will try this out sometime! Thanks Shelby! Let me know if you do. My husband loves those yeasty rolls you get from the Chinese restaurant. I can't wait to surprise him with a homemade version. Be sure to check out the rolls recipe link! Love learning new recipes and techniques. The step-by-step pics and diagram is awesome! lI can't wait to try this recipe and your instructions are amazing. Thanks Karen! Look at that beautiful fluffy rise on that bread! I need to make this. I've never heard of Hokkaido or Tangzhong and had no idea what I was getting into, but the bread looks absolutely incredible and your step-by-step photos help make it much less intimidating. I totally hope you try it! 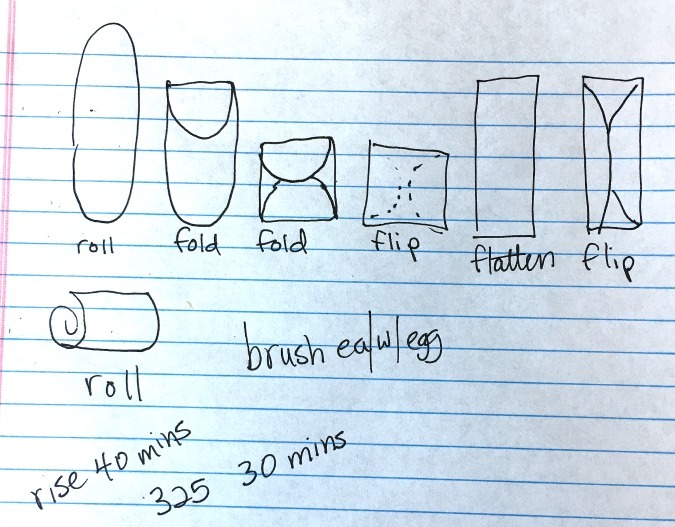 You bread looks beautiful and your step-by-step photos and diagram are really helpful too! It's a beautiful loaf as usual! I have never made bread with tangzhong (I've never even heard of it!) But niw I'm super curious and can't wait to try! I totally hope you do! This is such an interesting bread! I'm glad you included the step-by-step images to help with shaping! Looks fantastic! I love the diagram, it's so helpful. The bread looks amazing. Fluffy is right! You can use the dough to make fluffy rolls too. This bread looks so good and I love all of the details in the instructions.